James DeGale says he will "go back to the drawing board" after his shock defeat by American Caleb Truax at London's Copper Box Arena. DeGale lost his IBF world super-middleweight title as Truax won 114-114 115-112 116-112 on the cards. The Briton was as short as 1-100 with some bookmakers as he fought for the first time since January. "There's something missing in the ring," said 31-year-old DeGale, who had shoulder surgery in July. Truax, 34, offered constant pressure and rocked DeGale in the fifth as a stiff right drew gasps in the venue. DeGale, timid for large parts, rallied late on but Truax took the title. Speaking to BBC Radio 5 live after the fight, DeGale - who suffered his second professional defeat - added: "I honestly did [think I'd won], I've got to go back to the drawing board. "My nose is blocked again, I've got to sort it out. The shoulder - I had serious reconstruction - there's no pain but I'll have to go back, have a look and see. I've probably rushed back to be honest, maybe I should have waited till next year." He added: "I'm going to speak to Al Haymon [his boxing advisor] later, maybe I can get a rematch." Truax, who extended his record to 29-3, said: "All week all I heard was who he's going to fight next. Well guess what? Those fights are mine now. "I'd love to [fight in the UK again]. I'm staying until Wednesday - if anybody sees me, buy some pints." Truax sank to his knees on the bell and was convinced he had landed arguably the biggest shock the sport has seen this year. While DeGale had questions to answer following shoulder surgery in July and having suffered ear and dental damage in drawing with Badou Jack in January, he was expected to shine against the 34-year-old, who was contesting a world title for the second time. Big money bouts with WBA super-middleweight champion George Groves, or other stellar names at the weight such as Callum Smith or Chris Eubank Jr will likely now have to wait and afterwards DeGale said he hoped for a rematch. Shortly after the fight, Groves tweeted: "Call it a day, mate, you ain't got it no more." Eubank Jr wrote: "After all the trash talk and disrespectful comments James DeGale you go and put on a display like that! All I can say is WOW! You have properly let down British Boxing #Shameful." Minnesota's Truax achieved his goal in the sport of paying off his student debt with this bout but he will leave the UK with so much more thanks to a game fighting style which unsettled DeGale from the second round onwards. DeGale, 31, found himself backed to the ropes consistently and while there were flurries of good work, Truax's solid straight shot rocked his head in the third and a left hook landed crisply in the fourth. But it was the fifth where trouble really arose for the champion. He was bloodied and Truax delivered variety with good body work, a clean uppercut and later ramrod right. BBC Radio 5 live's ringside pundit Adam Booth pointed to DeGale showing "immense signs of distress" as he offered little in return. Earlier in the year, DeGale told BBC Sport he did not want too many more battles like he shared with Jack in January. But he had no choice but to dig in and take punishment as this slipped away from him. Two counter lefts in the seventh gave DeGale hope he had stemmed the flow but the challenger still walked his man down, digging a right hook into the left abdomen in the eighth. 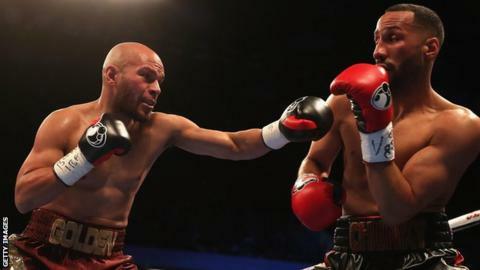 A good body shot from the 2008 Olympic champion briefly threatened to save him in the 10th but Truax was not to be denied as he dished up DeGale's second career loss. Caleb Truax on BBC Radio 5 live: "He was sleeping and now he's going to have nightmares about me. "All week all I heard was who he's going to fight next. Well, guess what, those fights are mine now. I'd love to [fight in the UK again]. I'm staying until Wednesday - if anybody sees me, buy some pints." BBC pundit and world-level trainer Adam Booth: "An hour ago James was world champion and thinking about unifying belts. Now he's being asked if he's a has-been former champion and it's brutal. It's easy for us to say we know what he can do and he didn't do it tonight, so he can't do it anymore. That's not necessarily the case." Elsewhere on the night, IBF world featherweight champion Lee Selbyclaimed a wide points win against Mexico's Eduardo Ramirez to all but seal an all-British dust up with Leeds' Josh Warrington early in 2018. Selby could not lose his title after Ramirez failed to make weight for the bout which was supposed form part of a world-title double header. But the 30-year-old excelled nonetheless, showcasing evasive footwork to move to 26 wins from 27 fights. WBO European light-heavyweight champion Anthony Yarde became the first man to stop the durable Nikola Sjekloca, completing the win with impressive combinations in round four. And heavyweight prospect Daniel Dubois took his record to six knockouts from six fights with a second-round stoppage of Wales' Dorian Darch.